Châteauneuf-du-Pape is a medieval village on the side of a hill, dominated by the ruins of an ancient château towering above. The château was the pope's summer retreat from the Palais and although all that remains are the foundations and two outer walls it is still an imposing sight and a wonderful viewpoint. The village below is a maze of well-restored medieval buildings and narrow streets that weave around the hillside. The village was once encircled by two concentric walls: the outer wall enclosed the chateau and the entire village, as far as the main road at the bottom of the village; the inner wall enclosed the chateau and only the highest part of the village. Today life in the village often involves working in the surrounding vineyards or selling the famous wine to the many tourists who visit. 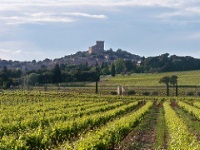 The Chateauneuf-du-Pape AOC is one of the most renowned wines of the Loire Valley; the area is particularly famous for its red wine. Naturally, there are great wine tasting experiences to be had in the village and Les Caves Saint Charles (located in the Pope's Cellar, which dates back to the 13th century) is a favourite wine tasting venue with tourists. The Chateau la Nerthe is a picturesque vineyard which has lovely grounds and also hosts great wine tastings. Visitors will be spoiled for choice with vineyards and tastings, however, and there are many to choose from. Address: The village is 11 miles (18km) northeast of Avignon.